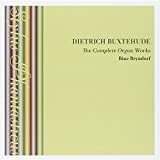 This acclaimed recording series of the complete organ works of Dietrich Buxtehude (c. 1637-1707) offers a unique musical journey in the footsteps of the Danish-German Baroque master. Organist Bine Bryndorf explores Buxtehudes inventive stylus phantasticus through the beautiful sound of five historic organs around the Baltic area, beginning in the composers native town of Elsinore, and ending in Lübeck, where his successor Johann Sebastian Bach famously went to experience the art of the ageing organ legend. Dieterich Buxtehude played a major role in shaping the various types of vocal music in his time. His experience as organist, composer,and director as well as his extensive knowledge of the contemporary repertoire, including Italian music made him the most originaland significant contributor to the early cantata in northern Germany. On this beautiful CD, Ton Koopman and his Amsterdam BaroqueOrchestra & Choir expose the unknown Buxtehude. The organ music of Dietrich Buxtehude is not solely an interesting precursor to the music of his later greater admirers but is a body of work full of beauty in its own right. These vibrant illustrative even exuberantly virtuosic organ works are here tackled admirably by Simone Stella on a modern Italian instrument which magically captures the colors of Danish organs.